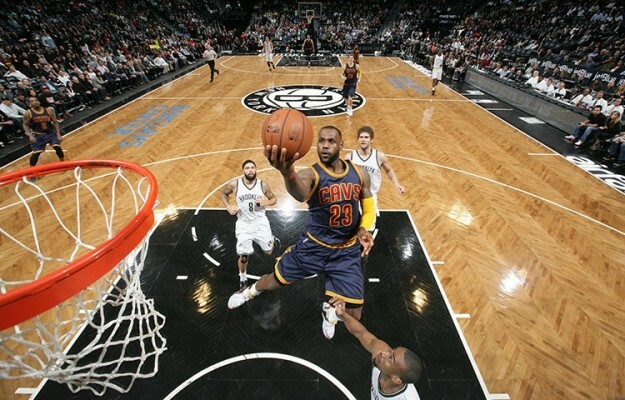 (Brooklyn, NY) — After a very competitive first three quarters, the Cleveland Cavaliers (47-27) eventually fell to the Brooklyn Nets (31-40) by a score of 106-98 on Friday night at the Barclays Center. The Cavs took a little step backwards on Friday night, as they were unable to build on a highly impressive 111-89 thrashing of the Memphis Grizzlies on Wednesday night at the FedExForum. With the Cavs and Nets tied at 79 apiece at the end of the third quarter, Cleveland was unable to gain a lead during the final 12 minutes. This was a huge win for Brooklyn, as they are currently one of a few teams in a logjam for the Eastern Conference’s final two playoff spots. Nets shooting guard Joe Johnson and center Brook Lopez both led the way for Brooklyn in scoring with 20 points each. Johnson added a team-high nine assists and a dagger three pointer late in the game, while Lopez nabbed nine rebounds on the night. Brooklyn was very efficient with their players that came off the bench, as the Nets had three players score in double figures. Bojan Bogdanovic (18 points and four rebounds), Jarrett Jack (16 points, five assists, four rebounds and two steals) and Alan Anderson (13 points and five rebounds) all came off the bench to score in double figures, as the Nets’ bench outscored the Cavs’ bench 54-21 in Friday’s game. On the night for the Cavs, Kyrie Irving led all scorers with 26 points to go along with his three assists and two blocked shots, while LeBron James added 24 points, nine assists, five rebounds and a whopping five steals. Kevin Love, who was the only other Cavalier to score in double figures, contributed 18 points and seven rebounds before he fouled out in the fourth quarter. After the Cavs scored a high number of points in the first two quarters, they still trailed the Nets 57-56 going into halftime. However, it was a below-average final 12 minutes for the Cavs, as the team finished the night a dismal eight of 30 from behind the three-point line. In his debut with the Nets after he signed a 10-day contract earlier Friday, former Cavaliers power forward Earl Clark came into the game in the third quarter to score seven points in just 12 minutes of action. “Brookyln got some contribution from Earl Clark, surprisingly, who just came to them and made some big baskets,” remarked Cavs head coach David Blatt following the loss. Up next on their schedule, the Cavs return home to face the lowly Philadelphia 76ers (18-55) on Sunday at Quicken Loans Arena. The game is scheduled to tip off shortly after 4:30 pm ET, while the Cavs will play six of their remaining eight regular season games at the Q.